I have taken half off at 23% retracement, trailing stops will do the rest! I missed the short at the gap support, I was being greedy and looking for the 61.8& retracement. The Eur has made a fractional new low but I am thinking there will be a little bounce due to the bullish engulfing candle, to the 38% retracement from this decline. It may not be strong enough to get that high, so a trailing stop loss and limit is in place, I have just gone long at 8421, looking for 8489, stop at 8408 the bottom of bullish engulfing candle. I have attempted to put together a view on the EURGBP as the end of the month is upon us. As it stands this month, a bearish engulfing pattern appears to be forming and rejecting the down trend line. The bearish engulfing candle also corresponds with a rejection of the 78.6% retracement. What I find very interesting to support the bearish view of the EUR is the Daily P&F chart. Coincidently the targets would correlate with the fib extensions. On the Daily candle chart, the EUR appears to be oversold (Stochastic) and is trying to bounce off the 38.2% retracement. A closer look appears to be a spinning top showing clear indecision. On a 4 hourly basis, there is a bullish engulfing candle and a falling wedge indicating a bit of bullishness may be sneaking in prior to a continuation of the down trend. The 1 minute P&F chart has given a target of 0.858 (It is not active as yet, to be active the price needs to increase above 0.8475 without breaching 0.842) whilst this target means nothing at the minute and this is surmising on the basis of the bullish engulfing candle, the 38.2% retracement should be a good place to look for short positions. As you can see on the 1 minute P&F chart there are three bearish targets from 0.8345 to 0.827, these are all active, so it will be quite risky opening a long position as it stands, if you do fancy ago at a long position, the stop would be below 0.841 which would negate the bullish engulfing candle on the 4 hourly chart. Any opinions or errors noticed, please speak up! This ones testing the main trendline and horizontal support. stops should be below previous days candle. This is the second eur trade today so eur is struggling a bit today. 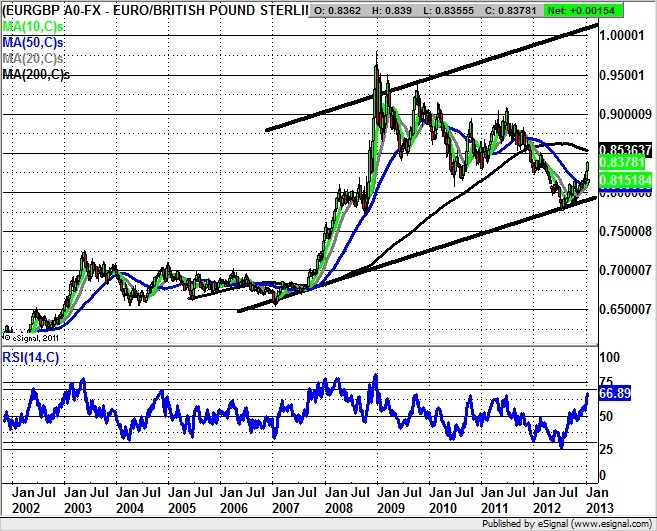 Found the article mentioned earlier, supporting the theory of EURGBP Parity (citing a Rising 2006 Price Channel). Euro looking strong against everything now. But! here's another take, which suggests that the Techincals favour GBP, citing the 0.87 as a strong barrier. (Not T/A but...) Former PM Harold Wilson did once say "It does not mean that the pound here in Britain, in your pocket or purse or in your bank, has been devalued." - before acting to devalue it further. I wonder if Sir Mervyn King will "sign off" in similar style to Trichet (the latter did it with a rate cut, the former could do it with another easing mechanism). My short entry based on the first touch is at 8627. Thats where i have the trend line currently at. I hope it goes back up to that level as it got close at 8606 today. Now then the bearish engulfing looks good at this level but the resistance support needs taking care of as remo pointed out. This looks like its testing the breakout point. will it hold???? It could be argued that the breakout point is 8153 as this level was the original resistance from june 11th. Last Edit: 29 Dec 2012 11:20 by remo. Looks like a perfect ascending triangle so a close above 8165 should be good to go long on the breakout. Target would be 8560 or possibly the slightly lower horizontal resistance at 8506. I am inclined to support the long position on this pair. The weekly has shown good HH`s and HL`s on its recent rise, with sensible pullbacks. The chart below imho is showing a new wave pattern starting, but i would liked to have seen a stronger pullback on wave 1 to 2. KI. ok, apart from remo, no one has bothered to get involved with this. Why cant folk post some charts with there views...even if they are miles out, i would like to see everyone getting involved. Without input the site will not flourish. PLEASE GET INVOLVED. KI. Please look in the store page under recommended books. Last Edit: 20 Nov 2012 23:35 by remo. couple of charts, what are we seeing on the daily ? These charts are just for you to look and try and pick out a long range trade, especialy on the daily. I will post the same charts with fibbo`s in the morning, but other views welcome. KI. Looking at this chart , there are some good potential signals which we may be able to as a group follow, for the next 4/8 weeks. I am closing off now but will post some charts in the morning.....maybe a good chance to watch and enter before a good run starts. Night all KI.